MENTAL ROADBLOCKS TO YOUR FITNESS SUCCESS! As the first quarter of 2010 is coming to an end, where do you stand with your 2010 Fitness Goals? Have you made progress or did your motivation sizzle out? Worse yet, have you given up? I hope not. Most people wait around for motivation to strike them like a lightning bolt. Well, I've got news for you motivation isn't something that just happens to you, it's something that you create for yourself; and that you need to work at constantly. If you don't feel motivated to achieve your goals, it is likely that "Mental Roadblocks" are holding you back. Checkout the following Mental Tips to help you overcome those roadblocks. You can do what you believe you can do, so visualize yourself accomplishing your goals. Remember the only person who can beat you is you; you are the only person who can hold you back. Like yourself, forgive yourself and love yourself despite past failures. Decide what is important in your life, set attainable goals; and focus on them. Stop each negative thought the moment it enters your mind, when it's at its weakest. Stop worrying. Give up the idea that things won't go right unless you worry about them. Look forward not back, if you believe the best is yet to come then it will. You become what you think about most. If you want to be in "shape" you're on your way to being in shape. Start your day by accomplishing your hardest task first; after that your day becomes easier and easier. Have goals for each day. Set small attainable goals, rather than one big one. "Eat the elephant bite by bite," it makes life a lot easier. Your mind is the key to how you feel, so convince yourself that exercise is fun, and it will be. Know why you do the exercises you do. What area of the body am I improving? How is this exercise making me better? To help make your workout fun,create a play list of songs that motivates you and gets you going; and use it as your sound track for workout success. It's OK to have a different one for each workout session. Successful workouts and music were made for each other. Every fitness decision you make either leads you closer toward achieving your goal, or farther from it. Missing a day of exercise is a decision away from your fitness goal. If you think you're fat, you'll stay fat. If you think you're fit, then you will be. It's that simple. Decide what you want and then put together a plan to get it. Once you've set your goals, your attitude either pushes you toward achieving the goal or failure. Again it's that simple. What's your choice? If you don't have set goals, you won't know where you're going. Positive Mental Attitude (PMA) is key to our success. To have the body of your dreams, you first have to believe you can have it. From there it's simply getting there. You can only have two things in life: excuses or results. Which do you want? We're all creatures of habit. Some more than others; but we all share this trait. For example what do you do every night before getting into bed? You brush your teeth. It doesn't take much thought since it is such an ingrained habit. Imagine if exercise was as much of an ingrained habit as brushing your teeth. You would quickly achieve your weight loss goal and improve your health; and stay fit. So there you have some idea on how to overcome those Mental Roadblocks to your fitness success. If you have any questions or need any help reaching your fitness goals contact me; and I'll be happy to help. Until next time, remember "Stay Fit You'll Feel Better." I recently found this recipe I think you'll like. It serves up a refreshing new twist on chicken. 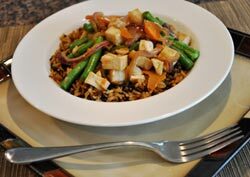 Delicious veggies and chunks of tender chicken are coated in a tasty sauce, and served over wild rice. It works great as a weekday meal, since it only takes about 20 minutes to make. 2 cups wild rice, cooked "
1 Tablespoon sesame oil "
1 sweet potato, halved and thinly sliced "
1/2 cup red onion, thinly sliced "
1 cup mushroom, sliced "
1 Tablespoon ginger root, minced "
3 cloves garlic, minced "
2 Tablespoons mirin (rice cooking wine) "
2 Tablespoons soy sauce "
1 Tablespoon toasted sesame oil "
1 teaspoon corn starch "
1/2 teaspoon crushed red pepper "
2 cups green beans, chopped "
1. In a large saucepan place the sesame oil over medium heat. Add the sweet potato, onion, mushroom, ginger and garlic. Sauté for 5 minutes. 2. In a small bowl combine the mirin, soy sauce, toasted sesame oil, cornstarch and red pepper. Set aside. 3. Add the green beans and chicken into the pan and continue to cook for 2 minutes. Pour the soy sauce mixture in and mix until fully incorporated. Cook for another 3 minutes. 4. Serve over wild rice. NUTRITION: One serving equals: 299 calories, 8g fat, 23g carbohydrate, 2g fiber, and 33g protein.